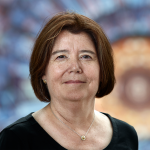 This year, the Carnegie Mellon University Alumni Association Board awarded Fermilab scientist Patricia McBride with a CMU 2019 Alumni Award in the Alumni Achievement Award category. She is one of 11 CMU Alumni Award recipients. The CMU Alumni Achievement Award is given to an alumnus for exceptional accomplishment and leadership in the nominee’s professional or vocational field, which brings distinction to themselves and honor to the university. The contribution need not be publicly renowned but should represent important creative effort or accomplishment with societal or educational impact and value. McBride is the deputy spokesperson for the CMS collaboration at the Large Hadron Collider at CERN. Previously, she served as head of the Particle Physics Division. She was also in the Computing Division for many years, serving as associate and then deputy head for five years. She has been a member of the CMS collaboration for more than a decade and has served on many national and international committees, including in leadership positions. She was elected an APS and an AAAS fellow in 2009. CMU will celebrate the honorees’ achievements and service on May 17 during commencement weekend.